The Black Ops 3 BLOP3 series is a Smith and Wesson M.A.G.I.C. spring assisted knife. Just a small nudge of the flipper or thumbstud opens the knife. 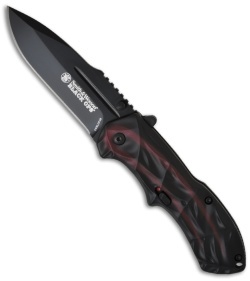 The action on this knife is great and it locks up tight via the liner lock frame. To prevent unintended firing, there is a safety on the handle. The aluminum handle has a unique texture along with an ergonomic shape for comfort and performance. The Black Ops blade is black coated 4034 stainless steel with thumb notches on the spine. 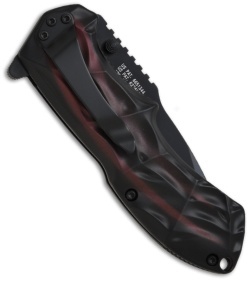 Comes with a pocket clip and lanyard hole. By all standards this is an exceptional knife for the money. It offers all the speed and convenience of an automatic knife in a well designed spring assisted package. If you're looking for a sub $50 spring assist knife chances are you won't find anything better than Smith & Wesson's Black Ops SWBLOP3 knives. My son and I are both very pleased with the workmanship that went into this knife. Very snappy opener and extremely sharp out of the box. Would recommend this knife !